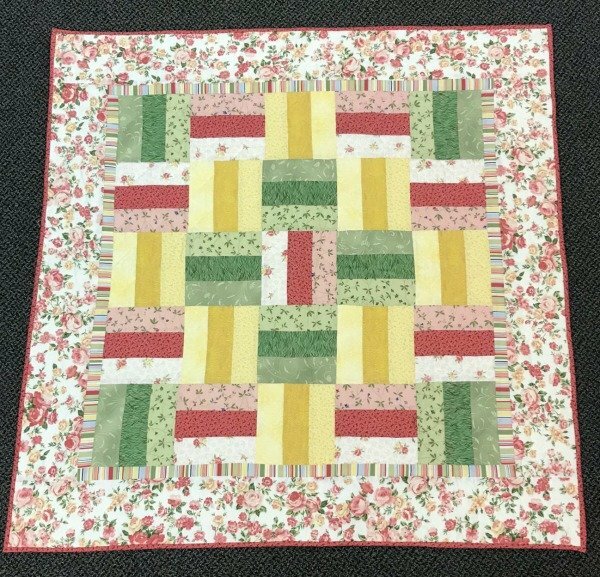 This very beginner class will teach you to choose fabrics, use a rotary cutter, sew a 1/4" seam, piece, quilt and bind this crib size quilt. It finishes at 41 1/2 x 41 1/2. Items needed for class: Rotary Cutter and 7x24" ruler (or one similar), straight pins, seam ripper, size 80 microtex needles, scissors, marking pencil. Bring your sewing machine, cleaned and oiled, with your 1/4" foot, power cord, slide on tray, bobbin, bobbin case. You'll need a walking foot when it's time to quilt. If you do not have a sewing machine, call us to arrange to use one of ours. Price includes tuition and the book "Start Quilting with Alex Anderson", all fabrics and supplies are separate purchases.